Percepta offer a set of core Warranty Support Solutions, developed in partnership with our Clients and designed to streamline claims processing, enhance both dealer and customer satisfaction and reduce overall warranty spend. 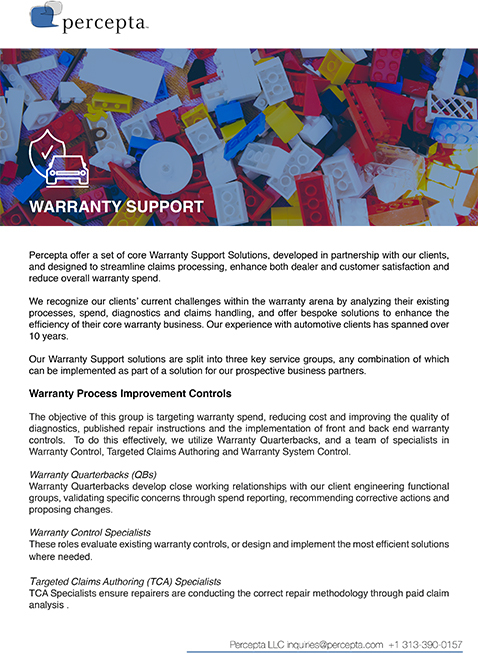 We recognize the current challenges within the warranty arena by analyzing our Clients’ existing processes, spend, diagnostics and claims handling and offer bespoke solutions to enhance the efficiency of their core warranty business. Our experience with automotive Clients has spanned over 10 years. Our Warranty Support solutions are split into three key service groups, any combination of which can be implemented as part of a solution for our prospective business partners. These include Warranty Process Improvement Controls, designed to target warranty spend, reduce cost and improve the quality of diagnostics, published repair instructions and the implementation of front and back end warranty controls. To do this effectively, we utilize Warranty Quarterbacks and a team of specialists in Warranty Control, Targeted Claims Authoring and Warranty System Control. Our Warranty Support Functions ensure the quality of manual and automated processes such as claims assessing, system controls and dealer facing communications are of a consistently high standard in order to maintain the Client’s business objectives. These include specialists in Quality Checking, as well as analytics, administration and communication. Lastly, our Claims Assessment Specialists deliver fair and consistent claims adjudication in line with Dealer facing published repair and claiming practices, whilst managing Client spend reduction objectives. 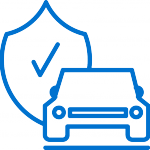 In 2005, Percepta began working in partnership with a large volume automotive brand with the aim of enhancing their warranty claims control process and reducing spend. Our Client had been managing its claims processing in the same way for several years, focusing primarily on throughput and had, over time, not seen any major cost avoidance from its annual warranty budget. They needed a new approach and gave Percepta the contract to develop a more efficient claims process, reduce spend and add value to the customer and dealer experience. We pride ourselves on our people and utilize staff with many years of warranty experience, both within the OEM and the dealer network. In addition, our insourcing approach, locating on our Clients premises, allows us to interact seamlessly with the OEM and external business partners. Our approach was to change the mind-set within the existing warranty team and the dealer network, combined with a total revamp of the claims handling process. A study of our Client’s current processes highlighted that 80-85% of claims were paid through an automated system, with the remaining 15-20% being audited by an assessing Center. Therefore, it was crucial to the success of this assessing Center to change the mind-set of the team to that of quality, rather than focus on the volume of claims processed. To kick start this process, new key performance indicators were negotiated with the Client. This would allow for not only a thorough analysis of the manually adjudicated claims, but also an eradication of systemic inaccuracies. We instigated various coaching and motivational training techniques to assist the team in understanding and performing to their new objectives, including the sharing of their positive impact on the overall cost avoidance opportunities. Making this change was critical for Percepta to deliver a return on investment for our Client. For the remaining 80-85% of claims still processed automatically through the warranty payment system, the natural next step was to carry out ‘deep dive’ analysis to identify if these would benefit from being manually adjudicated to allow further cost savings. The insight gathered during this process allowed us to identify key opportunities to improve the service being provided. Without losing sight of the quality of service, the team expanded and set about taking a consultative approach to certain claim types based on reported submissions, this in turn created a more structured approach and improved ROI. Through our analysis of paid claims it became evident that there was a requirement for some of the existing system paid claims to be selected for manual review to maximize the save potential. This led to the development of the Targeted Claims Authoring (TCA) team, who in addition to analyzing paid dealer claims, would also develop more detailed work instructions on certain claim types, in order to avoid inconsistencies in adjudication. As a result, the assessing Center could recruit less technically minded people due to the work instructions being made available, therefore reducing resourcing cost. System processed claims identified by the TCA Specialists as having a save opportunity were also subjected to the TCA process, and detailed assessing work instructions were developed for easier manual adjudication. System changes were made to select only those claims adding value. In some cases, these changes resulted in claims being returned for dealer correction along with useful advice on how to avoid error replication. This resulted in a reduction in future manual claims selection. At the height of the success of these new approaches, we were realizing annualized savings of circa $30 million. As we started to make recommendations to change the Client’s system parameters, we realized a need for the development of a team of Subject Matter Experts (SMEs) to review and perform the recommended changes within the Client’s systems. Some of our more experienced team members were drafted in to assist the existing Client incumbent in adopting the new process as well as maintaining the existing functionality. Over time, this Warranty System Controls team became the ‘go-to’ team with regards to understanding the limits of the proprietary systems and working out ways to implement controls within these constraints. This team is considered by our Client to be pivotal to their business. To ensure these changes continued to impact the business, we introduced a quality check process to audit the output from the TCA team; a percentage of manually processed claims as well as claims paid automatically by the system. Working closely with the TCA team, Quality Checkers passed recommendations of specific repair or claim types that required clear work instructions for the Claims Assessors to maximize cost savings. This ensured a level of consistency across claims assessing and allowed the performance of the assessors to be easily monitored and benchmarked. Today, a by-product of the Quality Checking process is that we are able to assist our Clients to achieve their internal financial audit requirements. As we continued to enhance efficiency with claims processing, it became clear that developing a closer working relationship with our Client’s engineering departments would be vital in achieving the overall aim of the project. Warranty Quarterbacks (QB) would play this role, liaising with engineering teams across Europe and deploying cost control solutions that would further reduce spend and increase ‘right first time’ repairs and customer satisfaction. The positive impact of QBs could be seen across the business, and to ensure their success continued, we created a team of Warranty Control Specialists, who would work within a specific engineering functional group. Where a product concern has been identified, they created the most efficient warranty control or adapted existing controls to address the issue. In order to ensure the continued success of these warranty solutions, we developed a team to deliver support across the business. An analytics team developed dashboards and standardized reports on the performance of the changes we had implemented, which would allow the Client to track the impact we had on warranty spend. To add further value, the analysts also measured dealer performance against various criteria set out in dealer contracts such as cost per repair and specific dealer repair costs spikes. An administration team was also on hand to provide support for SharePoint sites, archiving existing content and ensuring compliance with existing and newly developed controls. Finally, we assumed responsibility for all warranty publications, to ensure swift and accurate communications across Europe. Our Communications Specialist is responsible for authoring Warranty documentation and ensuring it is translated into all relevant languages and communicated to all dealers. This included the Warranty Manual, Warranty Claims Coding Manual, Warranty News and Warranty Bulletins etc. We are now considered to be an intrinsic part of our Clients’ business and have moved from a directed service provider to consultative decision maker and trusted advisor.